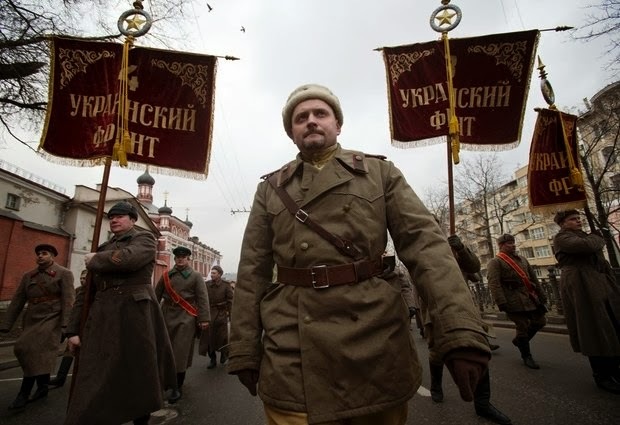 Pro-Kremlin demonstrators dressed in WWII army uniforms and carrying replicas of Soviet Army WWII banners reading, Ukrainian Front, march in central Moscow, Russia, Sunday, March 2, 2014 to express support for the latest developments in Russian-Ukrainian relations. Banners are those of units that were liberating Ukraine from Nazi occupation during WWII. PEREVALNE, UKRAINE (AP) — Russian forces surrounded a Ukrainian army base Sunday just as the country began mobilizing in response to the surprise Russian takeover of Crimea. Outrage over Russia's tactics mounted in world capitals, with U.S. Secretary of State John Kerry calling on President Vladimir Putin to pull back from "an incredible act of aggression." Fearing that Europe's borders were being rewritten by force, world leaders rushed to find a diplomatic solution to the dispute. But there was no denying what had already happened on the ground: Russia captured the Black Sea peninsula on Saturday without firing a shot. Ukrainian Prime Minister Arseniy Yatsenyuk said there was no reason for Russia to invade Ukraine and warned that "we are on the brink of disaster." "We believe that our western partners and the entire global community will support the territorial integrity and unity of Ukraine," he said Sunday in Kiev. NATO held an emergency meeting in Brussels, Britain's foreign minister flew to Kiev to support its new government and the U.S., France and Britain debated the possibility of boycotting the next Group of Eight economic summit, being held in June at Sochi, the host of Russia's successful Winter Olympics. In Kiev, Moscow and other cities, thousands of protesters took to the streets to either decry the Russian occupation or celebrate Crimea's return to its former ruler. "Support us, America!" a handful of protesters chanted outside the U.S. Embassy in Kiev. One young girl held up a placard reading: "No Russian aggression!" "Russia! Russia!" the crowd chanted in Moscow. Kerry, interviewed Sunday on U.S. television news shows, talked about boycotting the G-8 summit, as well as possible visa bans, asset freezes and trade and investment penalties against Russia. Kerry said all the foreign ministers he had talked to were prepared "to go to the hilt" to isolate Russia. NATO issued a statement saying it "condemns Russia's military escalation in Crimea" and demanding that Russia respect its obligations under the U.N. charter. Ukraine is not a NATO member, meaning the U.S. and Europe are not obligated to come to its defense, but the country has taken part in some alliance exercises. "It is still possible to turn around. A new division of Europe can still be prevented," said German Foreign Minister Frank-Walter Steinmeier said. So far, however, Ukraine's new government and other countries have been powerless to counter Russia's tactics. Armed men in uniforms without insignia have moved freely about Crimea for days, occupying airports, smashing equipment at an air base and besieging a Ukrainian infantry base. Putin has defied calls from the West to pull back his troops, insisting that Russia has a right to protect its interests and those of Russian-speakers in Crimea and elsewhere in Ukraine. His confidence is matched by the knowledge that Ukraine's 46 million people have divided loyalties. While much of western Ukraine wants closer ties with the 28-nation European Union, its eastern and southern regions like Crimea look to Russia for support. Russia has long wanted to reclaim the lush Crimean Peninsula, part of its territory until 1954. Russia's Black Sea Fleet pays Ukraine millions every year to be stationed at the Crimean port of Sevastopol and nearly 60 percent of Crimea's residents identify themselves as Russian. During a phone conversation Sunday with German Chancellor Angela Merkel, Putin "directed her attention to the unrelenting threat of violence from ultranationalist forces (in Ukraine) that endangered the life and legal interests of Russian citizens," according to a Kremlin statement. The statement also said "the measures taken by Russia are fully adequate with regard to the current extraordinary situation." Ukraine's new government came to power last week following months of pro-democracy protests against a pro-Russian president, Viktor Yanukovych, and his decision to turn Ukraine toward Russia instead of the EU. Yanukovych fled to Russia after more than 80 people were killed in the protests. He insists he's still president. Ukraine's acting president, Oleksandr Turchynov, put Ukraine's armed forces on alert and stepped up security at nuclear power plants, airports and other strategic locations. On Sunday, the government issued a decree to begin calling up reservists for training but no overt military actions by Ukraine have been seen. Turchynov also appointed 18 new regional governors, including two oligarchs in the eastern cities of Dneprotrovsk and Donetsk, as big business and the new Ukrainian government united against Russia. Ukraine's richest man, oligarch Rinat Akhmetov, called Russia's use of force "impermissible." "I call upon all my fellow citizens to unity for the sake of a whole and undivided Ukraine ... Our strength is in the solidarity of business, government and society," he said in a statement Sunday. Akhmetov's SCM Group has 300,000 employees and interests in steel, coal and mining. Russian troops, meanwhile, pulled up to the Ukrainian military base at Perevalne on the Crimean Peninsula in a convoy Sunday that included at least 13 trucks and four armored vehicles with mounted machine guns. The trucks carried 30 soldiers each and had Russian license plates. In response, a dozen Ukrainian soldiers, some with clips in their rifles, placed a tank at the base's gate, leaving the two sides in a tense standoff. It appeared to be the first known case of outmatched Ukrainians standing up to Russian military might. Unidentified soldiers were also seen cutting power to the headquarters of the Ukrainian Naval forces in Crimea — whose own commander defected later Sunday and pledged his allegiance to "the people of Crimea." In Kiev, a Ukrainian security official said the head of the Ukrainian Navy — Adm. Denis Berezovsky — had been dismissed and faces a treason investigation after declaring his allegiance to the pro-Russian government of the Crimea region and offering no resistance to the Russian troops. The speaker of Crimea's legislature, Vladimir Konstantinov, was quoted as saying local authorities do not recognize the new government in Kiev. He said a planned referendum on March 30 would ask voters about the region's future status. A convoy of hundreds of Russian troops was also seen heading toward Simferopol, the regional capital of Crimea. Armed men in military uniforms without markings strolled around Simferopol's central plaza, Lenin Square, outside its Council of Ministers building. "It is very important that we all do everything we can to calm tensions," said British Foreign Minister William Hague, who flew to Kiev on Sunday. He said he has urged Russian officials to "speak directly to the Ukrainians" but so far they had not. President Barack Obama talked with Putin by telephone for 90 minutes Saturday and expressed his "deep concern" about "Russia's clear violation of Ukrainian sovereignty." Obama warned that Russia's "continued violation of international law will lead to greater political and economic isolation." In Moscow, at least 10,000 people bearing Russian flags marched freely through the city Sunday, while a few dozen demonstrating on Red Square against the invasion of Ukraine were quickly detained by Russian riot police. "We understand that the West wants to attack us and seize this territory. It (the West) is dangerous to us," said Victor Sidelin, a Moscow resident at the march. McHugh and Yuras Karmanau reported from Kiev, Ukraine. Greg Keller in Paris, Laura Mills and Lynn Berry in Moscow, Tom Strong in Washington, Tim Sullivan in Crimea, Greg Katz in London and Geir Moulson from Berlin also contributed to this story.